Born and raised in Toronto, Dr. Yulien Sun knew from a young age that caring for animals would be her life’s calling. She began in high school by volunteering at local animal hospitals and animal welfare organizations. In 2004, she graduated from the University of Guelph with a Bachelor of Science in Animal Biology and went on to complete her veterinary degree from the University of Melbourne in 2008. Upon graduation, she honed her veterinary medicine and surgical skills through a rotating internship at the Veterinary Emergency and Referral Group (VERG) in Brooklyn, New York. She remained at VERG after her internship as their staff emergency doctor, furthering her interests in emergency/trauma, surgery, toxicology, and behavior. 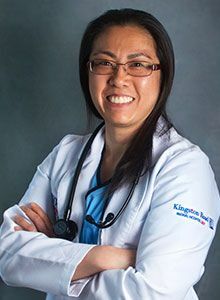 Today, Dr. Sun brings her passion and experience to Kingston Road Animal Hospital to service The Beaches community. Providing well-rounded and integrative healthcare for animals is her top priority as the clinic’s Medical Director. She continues her education now in Traditional Chinese Veterinary Medicine and completing her certification in veterinary acupuncture. Her daily work is aided by her four-legged sidekick, Ky, a self-assured and diligent Jack Russell terrier that keeps watch against the dangerous squirrels. When the pair are not at work, you will find them delighting in some of the city’s culinary treats.